Viva Carbon is among the reliable coal suppliers in India for steam coal (thermal coal) and coking coal. We are trusted imported coal suppliers in India of US coal, South African coal, Colombian coal, Chilean coal, Indonesian coal and Australian coal. We are preferred coal suppliers to top cement, power and steel industries in India. Customers value our consistent quality, reliable supplies and personal service. Viva Carbon is among the trusted steam coal suppliers in India. We import steam coal (thermal coal, non-coking coal) supplies of various origins and grades. India is the second largest consumer of coal in the world. In 2018, India's thermal coal imports crossed 170 million tons. Viva Carbon is among the trusted metallurgical coal suppliers and importers in India. Metallurgical coal (met coal or coking coal) is used in steel production. By 2023, India is expected to become the world's largest importer of metallurgical coal. Viva Carbon imports high quality coals from major coal miners in the world. Our customers thus have access to a wide range of coals of various origins, grades, delivery and pricing options. Viva Carbon is among the top US coal suppliers in India. We are reliable suppliers in India for high GCV US steam coal imports from major coal mines in USA. We specialise in high-GCV, low-ash imported US coals such as Northern Appalachian coal (NAPP coal)and Illinois Basin coal (ILB coal). US coal accounts for around 7% of India's thermal coal imports. US coal is popular in India because of it is high-GCV content as compared to lower quality, cheaper coals. In 2018, US coal imports to India were around 12.5 million tons. Viva Carbon is among the trusted South African coal suppliers in India. Viva Carbon supplies various grades of imported South African coals from leading coal mines in South Africa. We supply RB1 coal and RB3 coal grades from Richards Bay terminal to Indian ports. We specialise in supplies of high GCV South African steam coal imports ranging from 5500 to 6000 kcal/kg NAR. South African coal accounts for over 60% of India's thermal coal imports. South African coal is popular in India because of it is high-GCV content as compared to lower quality, cheaper coals. In 2018, South African coal imports to India were around 40 million tons. Viva Carbon is among the reliable Colombian coal suppliers in India. We supply Colombian steam coal from major Colombian mines to industries in India. Viva Carbon is among the trusted Chilean coal suppliers in India. We supply Chilean steam coal cargos from Mina Invierno mine in the Magallanes region in South Chile. 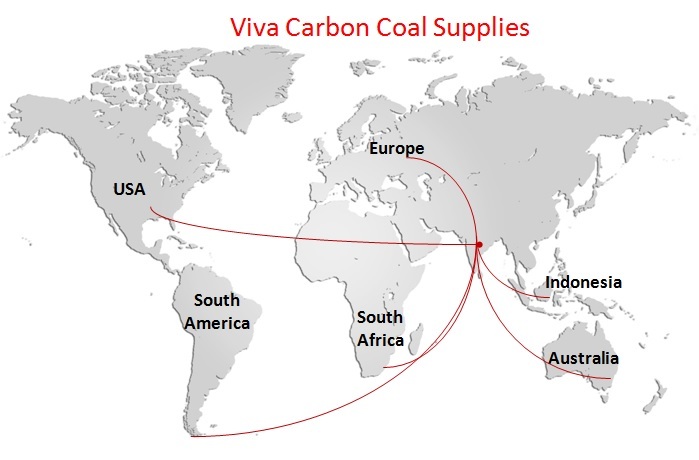 Viva Carbon is among the reliable Indonesian coal suppliers in India. We are suppliers of Indonesian coal imports from Indonesia's coal rich Kalimantan region to Indian ports. Indonesian coal accounts for more than 60% of India's thermal coal imports. Indonesian coal is the most popular coal in India, as companies find it cost-effective. In 2018, Indonesian coal imports to India were around 100 million tons. Viva Carbon is among the reliable Australian coking coal suppliers to steel industries in India. We supply metallurgical coal cargos from the Newcastle coal region in New South Wales, Australia.